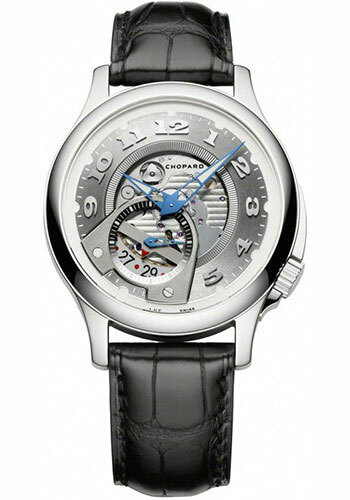 41.00 mm 18K white gold case, sapphire crystal back, off-center crown, grey and silver dial with small seconds and date pointer at 7 o'clock, automatic self-winding COSC movement with hours, minutes, small seconds, date, approximately 65 hours of power reserve, hand-stitched black alligator strap. Water resistant to 30 meters. 41mm stainless steel case, off-center crown, black and silver dial with small seconds and date pointer at 7 o'clock, automatic self-winding Calibre L.U.C 96 TB movement, approximately 65 hours of power reserve, leather strap with pin buckle. Water resistant to 30 meters.